Making, managing, and saving money are essential skills that we all need in order to successfully make our way in the working world. While we learn fundamental math in school, we aren’t really taught how to deal with money in our pocket. Spending cash doesn’t require much intelligence, but saving and investing money sure do. Studies have shown that it’s a good idea to introduce the value of money to kids starting at a young age. Of course, preschoolers aren’t ready to tackle balancing a checkbook, but they certainly can grasp basic concepts like “more” or “less.” In elementary school, kids begin to figure out how to save the money they’re given and, eventually, they will learn how to earn and invest funds for themselves. So how can we teach our kids to appreciate money and handle it responsibly? What are some ways we can stress the importance of saving money? Little ones love to use scissors and they love to collect things. 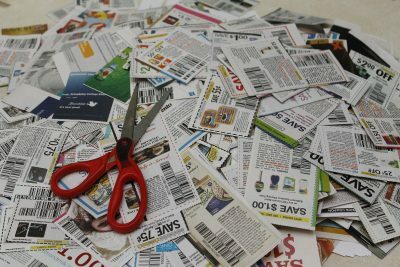 They’ll love creating a coupon collection! Place a grocery flyer in front of your child and ask her to cut out coupons for the foods that you’re going to buy. Explain (briefly) what the coupon represents and how it works. Decorate an envelope to hold the coupons and have your little one take it with them on the next trip to the grocery store. Although they may not fully comprehend how the process works, they’ll see that the coupons are directly helping to secure food for the family. In other words, they’ll know they made a difference! Decorate a glass jar and explain that it’s meant to hold spare change that will eventually be used to buy something that the entire family will enjoy (for example, a popcorn popper or a Netflix subscription). Tell the kids that any change they find (under the couch, on the sidewalk, in the laundry machine etc.) should be dropped into the jar. 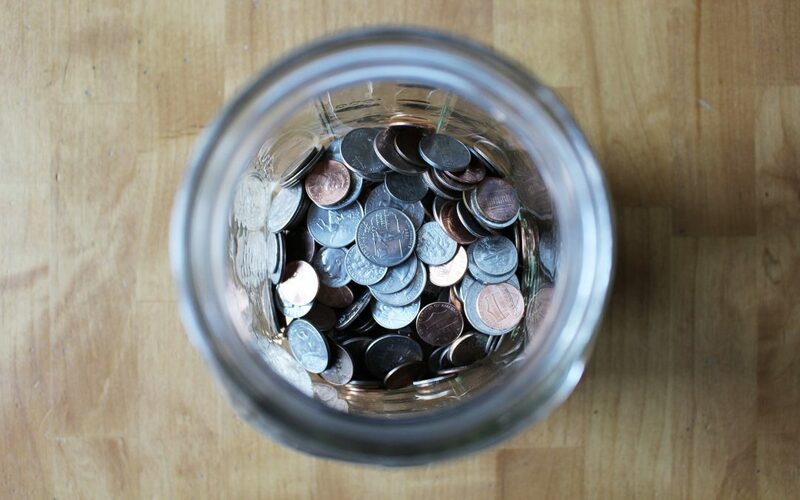 When the jar is full, come together to roll the coins and count how much has accumulated. Take a moment to reflect on where the change would have wound up if it hadn’t been saved and then celebrate by purchasing the much-anticipated gift! Want to get your kid’s attention? Offer them double or nothing! How about offering to match whatever amount your child saves? When it comes to money, kids want as much as they can in as little time as possible. A dollar for dollar match will curb their impulse to spend and encourage them to bank their bucks instead. Go ahead and create your own faux cash in fun colors or patterns. Set up a “store” using household items and practice exchanging money and counting change. The next time you go shopping, have your little one bring along the colorful cash. Tell them not to lose it and stress the importance of keeping money safe. When you hit the stores, teach them how to compare prices and search out a sale. Before you know it, they’ll be an expert bargain hunter! Some kids benefit from visual reminders, like a chart that reflects how much money they wants to save and how much they has at the moment. The chart can be any style, as long as it’s easy to read and update (for example, a dry erase board works well). At any stage you can help her mark her progress and determine how much more cash they need to reach their goal. When your kid outgrows their piggy bank, take it to the next level and open a savings account at a bank! As the parent, you still manage the money, but your little one will start to learn how banks function. Look for an account where no minimum balance is required and there are zero monthly fees and a high interest rate. Check to see if you can access the account info online as well as receive in-person support. It’s always fun to take a field trip to the bank to “check on the money,” and ask any questions of the staff. A quick search on the Internet will reveal lots of sites dedicated to teaching youngsters about money and fiscal responsibility. For example, there are games that explain how to conduct a sales transaction and make correct change, and guides to balancing a checkbook for the first time. 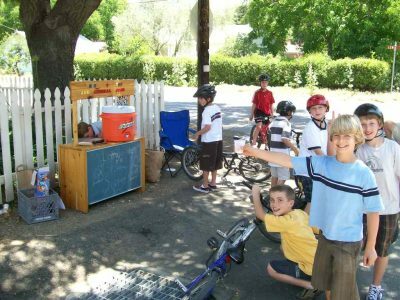 Older kids usually enjoy the challenge of building a business from the ground up. Whether it’s a weekly lemonade stand, a weekend car-washing gig, or a daily dog-walking route, establishing a steady job requires commitment, determination and follow through. This is a great opportunity to cover business basics like overhead costs and projections, including how much will be earned over one week, one month, 6 months, and one year. Perhaps the most fun part is to come up with a clever business name and logo and ways for the kids to promote their special skills. Unfortunately, children aren’t guaranteed to have money smarts. The truth is, some kids are inherently impulsive spenders while others are natural savers. 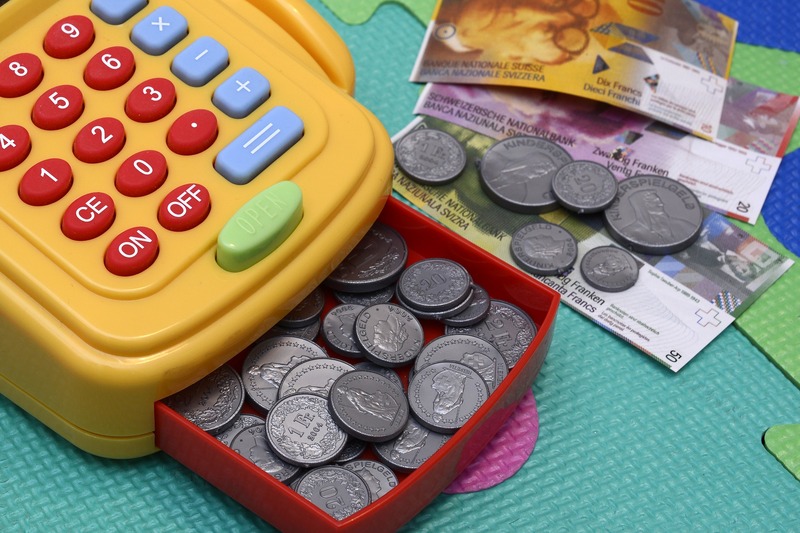 Regardless of where your little one falls on the spectrum, studies have shown that the best time to introduce the concept of money management is early on. To begin, parents need to teach their children certain skills so they can eventually earn money and keep track of it all by themselves. The list above details 8 thoughtful, clever and organized ways kids can learn about saving. The next time your child is juggling a handful of change or receives a hefty birthday check, you’ll be comforted that they’ll know just what to do with it. 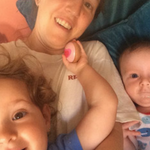 Samara Kamenecka is a VA specialized in SEO and writing, living in Madrid. You can find her blabbing about everything from parenting tips to pregnancy gear at www.tinyfry.com .